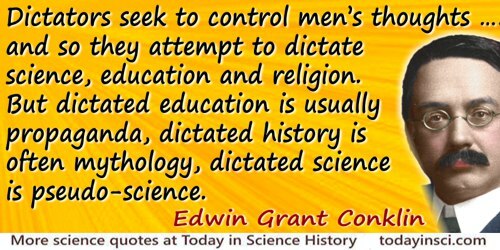 Dictators seek to control men’s thoughts as well as their bodies and so they attempt to dictate science, education and religion. But dictated education is usually propaganda, dictated history is often mythology, dictated science is pseudo-science. From Address as retiring president before the American Association for the Advancement of Science, Indianapolis (27 Dec 1937). Published in 'Science and Ethics', Science (31 Dec 1937), 86, No. 2244, 601. Indeed, the ideal for a well-functioning democratic state is like the ideal for a gentleman’s well-cut suit—it is not noticed. For the common people of Britain, Gestapo and concentration camps have approximately the same degree of reality as the monster of Loch Ness. Atrocity propaganda is helpless against this healthy lack of imagination. In 'A Challenge to “Knights in Rusty Armor”', The New York Times (14 Feb 1943), Sunday Magazine, 5. No man who has not a decently skeptical mind can claim to be civilized. Euclid taught me that without assumptions there is no proof. Therefore, in any argument, examine the assumptions. Then, in the alleged proof, be alert for inexplicit assumptions. Euclid’s notorious oversights drove this lesson home. Thanks to him, I am (I hope!) immune to all propaganda, including that of mathematics itself. In 'What Mathematics Has Meant to Me', Mathematics Magazine (Jan-Feb 1951), 24, 161. Such an atmosphere is un-American, the most un-American thing we have to contend with today. It is the climate of a totalitarian country in which scientists are expected to change their theories to match changes in the police state's propaganda line. Opening address (13 Sep 1953) at the annual meeting of the American Association for the Advancement of Science where Condon would be elected as the new AAAS president. Obituary, New York Times (27 Mar 1974), 46. The greatest challenge facing mankind is the challenge of distinguishing reality from fantasy, truth from propaganda. We must daily decide whether the threats we face are real, whether the solutions we are offered will do any good, whether the problems we’re told exist are in fact real problems, or non-problems. The moment philosophy supposes it can find a final and comprehensive solution, it ceases to be inquiry and becomes either apologetics or propaganda.